Then, on one of those rare occasions when I do crave a (good) fizzy soft drink, my choice is usually highly predictable: ginger ale. For a starter, I love ginger in everything - food or drink, sweet or savory. 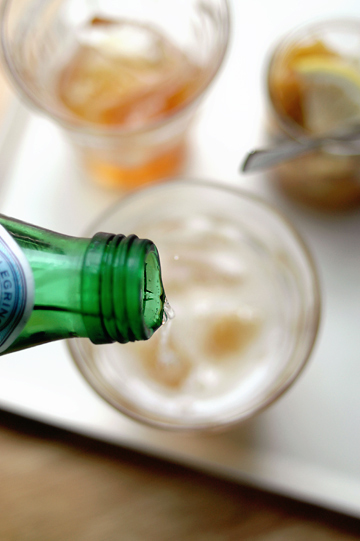 As a carbonated drink, the fizz nicely complements the spiciness, which balances out the overall sweetness. I'm not going to argue that ginger ale is any 'healthier' or 'better' than other sodas, but I do like it better in a way that it's not just sugary sweet and overloaded with artificial flavors like some others. Added to other drinks, it can make a light and spicy mix; I've long been known to mix ginger ale with tea and fruit juice. 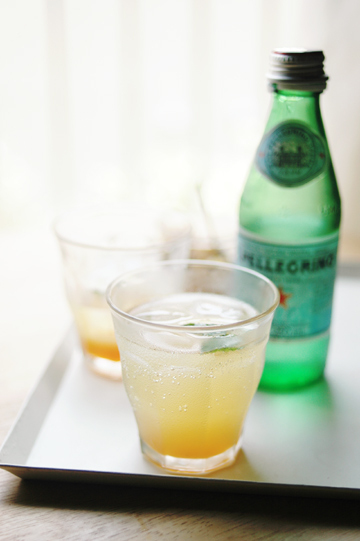 Even cocktails that I like involve ginger ale - with beer (Shandygaff) and red wine (Kitty), among others. As a kid, I wasn't allowed to drink soda (or any store-bought soft drink, for that matter) too much at home. So when I did get to have some, I'd be ecstatic. And even back then when I'd be happy with any soda drink that I could get my hand on, ginger ale had a special place in my heart. To a young and cheeky girl that I was, the thing tasted so grown-up - perhaps due to its spiciness - and even the name 'ale' sounded as if it was an alcoholic drink. Notwithstanding my longstanding soft spot for ginger ale, it didn't occur to me until quite recently to make my own ginger ale at home. 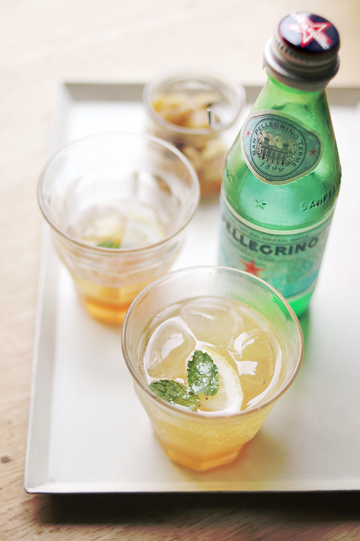 And when it did, I was thrilled; home-made ginger ale, wow, how cool is that? I cannot remember where I first saw it, but all you need is, basically, cooking up a lot of ginger with sugar and some other spices (usually chili pepper and cinnamon) and maybe lemon, and diluting the syrup with sparkling water. It can't get any simpler, right? And yet it has taken me another few years to finally get around doing it, only not in a regular way. As it happens, this summer I've been making a whole lot of ice cream and sorbet using honey instead of sugar (about which I hope to write here, too... well sometime, hopefully), and it seemed only natural for me to try and make ginger syrup with honey, too. A quick Internet search showed me that I was hardly the first person to come up with this idea, and a host of people seemed to have been making honeyed ginger and enjoying it in home-made honeyed ginger ale. How much ginger and honey you need or what you add to the syrup vary from one recipe to another, so I did an improvisation using what I had at hand (except I did go out and bought some organic ginger root). I started with only a small amount of everything, just to see how it'd turn out. Here I had: 1/4 cup (4 tbs / 60 ml) or so of honey; a small knob of fresh ginger root, skin scrubbed off, thinly sliced, blanched and pat-dried; half a stick of cinnamon; a chili pepper, seeded; a few cardamom pods, half crushed; a few cloves; a dozen black peppercorns; and a few slices of lemon. Once you have sliced up your ginger, you basically put everything together in a clean jar or a whatever container that holds everything comfortably, cover and let it sit in the fridge for a few days to infuse all the flavor into honey. As for the preparation of ginger, some recipes tell you to leave the skin on, others off; and some say you should cook it first in boiling water (to remove excess bitterness, I think), others, well, don't bother. I chose to remove the skin, and quickly blanch the slices in boiling water - an easier (and/or lazier) alternative to cooking them for 15-20 minutes. But whatever you do, you'll want to slice the root as thin as possible to maximize the flavor of your syrup. 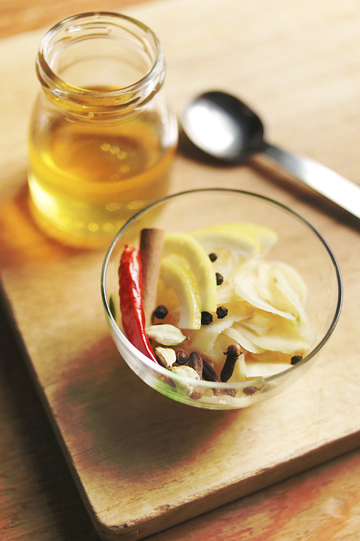 Among different recipes I've seen, common 'add-ons' for home-made ginger ale include chili pepper and lemon - and sometimes cinnamon and cloves, too. I used them all, and added cardamom and black peppercorns, too - well, because I like them. I crushed the cardamom pods to let them yield more flavor, but I should probably have done the same to the chili pepper and peppercorns. Whatever you use, I think you can use little more of this or less of that, but everything should be immersed completely in honey; I had to push everything deeper into the jar. Now, with a regular ginger ale syrup, you'll probably cook the sliced or chopped (or maybe even grated) ginger root in water and sugar, and the syrup will be ready to use as soon as it is chilled. When you steep the spices in honey, however, it takes a little longer to extract flavors (especially those of dried whole spices), so you'll need to wait for at least a day or two before you can finally drink your own ginger ale. A few recipes I saw actually said you cook ginger in honey, and that way you can probably use the syrup right away, I imagine - but can't tell for sure as I haven't tried it that way myself. 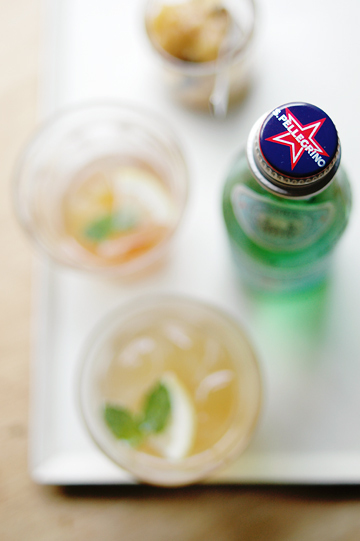 Anyhow, once your syrup is ready, you are only a pour of chilled sparkling water away from a most refreshing glass of cooler you'll have on a hot summer's day. Ice cubes are not a must, but a few extra slices of lemon and maybe a mint leave or two will make things look and taste nicer. Although not visible from the pictures, I also added a little squeeze of juice of ginger to boost the potency of the spice. Oh that was good! I think you can use any type of honey you happen to have around to make the honey-ginger syrup, though a light, mild-tasting honey should showcase the flavors of spices better. But a darker honey with a strong taste would give your drink an interesting tone, which could be fun to experiment with. For the jar of syrup pictured above, I used a mild and fruity apple honey, while what you see in other images, shown in the glasses along with a green bottle of S. Pellegrino, came from another batch that I'd made with a dark amber leatherwood honey that has unique woody overtones. Both turned out good in their own ways. Now if you plan to serve a group of people your home-made ginger ale, you'll need a lot more of ginger and honey to start with than what I used here; mine made only a couple of glasses of ginger ale, which I finished in no time. 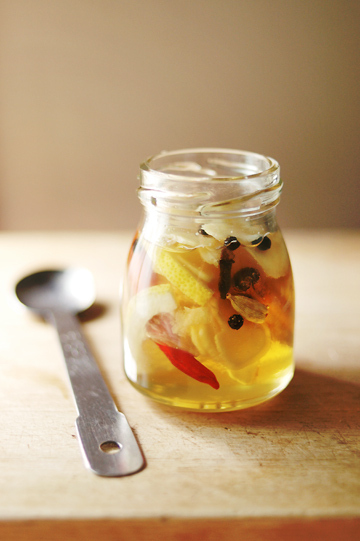 And in fact, you might as well make a lot - the idea of steeping slices of ginger root in honey (with or without a few other things) isn't solely for making ginger ale, but more as a way to preserve fresh ginger when you have large pieces of it. But even when you tripled or quadruplicate honey and ginger, you probably won't need to do exact the same with other ingredients; a small amount of whole spices like cinnamon sticks and peppercorns can go a long way, so you'll want to go easy on them. 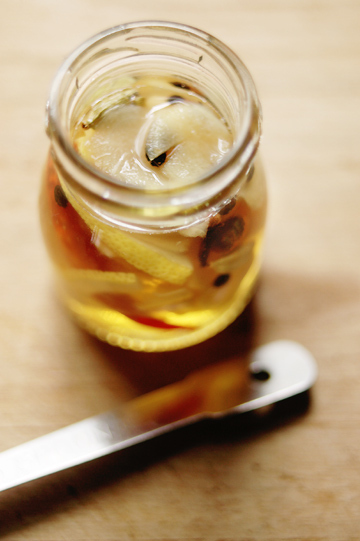 Other than (honeyed) ginger ale, there are a number of ways you can use the honey-ginger syrup. You can use it to sweeten your tea, iced or hot, or simply dissolve it in still water along with juice of lemon, which will also make a soothing ginger-honey lemonade, either chilled or hot. Or use it as a syrup over your plate of waffles, pancakes, or even toast - now that will help wake you up in the morning! It should also be great to be drizzled over a good scoop of vanilla ice cream. And this just occurred to me, but wouldn't it make a super refreshing drink, topped with sparkling wine instead of sparkling water? I must try it. I cannot tell exactly how long the syrup keeps, but it should be fine for at least a couple of weeks, tightly covered and stored in the refrigerator. I've heard that cooking the ginger slices first helps the whole thing last a little longer, but I haven't tried it. I've also seen people chop up the ginger (but not other spices and lemon) and use it in baking cakes - lemon or orange pound cake, banana bread, chocolate cake, fruit cake, and oh, gingerbread, perhaps? That's something I think I'll try next time I make the syrup...or maybe once it's cool enough for me to turn the oven on. Oh I CANNOT wait! We've been told that we are having a summer that's cooler than it should be this year, but it still is hotter than I'll ever want it to be, if you ask me. I've got a lot of work to do, a room full of stuff to clean up, and a trip or two to plan...none of which is getting very far, thanks to the heat that is effectively battering me. It seems as if the summer is drawing near to an end, very slowly, yet I reckon a few more larger batches of honeyed ginger ale (and iced chai) will perfectly fit in before it's finally over. Hope you are all well and surviving the heat (or the chill, if that is the case with you)! hello miss chika, i've been making homemade ginger syrup all summer, too. since the weather has been crazy, i've sometimes had it as a soda, but more often as a hot drink. mine haven't been as exotic nor as exciting as yours, though! Been meaning to make homemade ginger syrup all summer. We still have many days of heat left so this will be perfect! santos - nah a simple and classic one does a trick, too. This looks delicious. 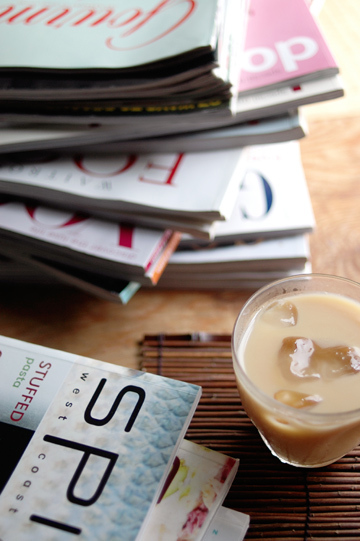 I love ginger and normally make ginger tea (black tea poured over muddled ginger, no milk). I'm definitely going to try it when I go home for the holidays. Your photos are beautiful - a great blog!